1. See Book of Mormon Central, “Why Does Nephi Use Isaiah 29 as Part of His Own Prophecy? (2 Nephi 26:16),” KnoWhy 52 (March 11, 2016); Robert A. Cloward, “Isaiah 29 and the Book of Mormon,” in Isaiah in the Book of Mormon, ed. Donald W. Parry and John W. Welch (Provo, UT: FARMS, 1998), 191–247. 2. Emphasis is added to all scriptural passages in the chart. 3. See Amanda Colleen Brown, “Out of the Dust: An Examination of Necromancy as a Literary Construct in the Book of Mormon,” Studia Antiqua 14, no. 2 (2016): 29–32. 4. See also, Leviticus 20:6, 27 and Deuteronomy 18:10–11; 1 Samuel 28:3, 7–9; 2 Kings 21:6; Isaiah 8:19; 19:3. For further descriptions of these practices as being evil, see 1 Chronicles 10:13; 2 Chronicles 33:6. In all of these passages, the word “familiar” is implied in the Hebrew words for ghost or spirit. 5. For a discussion of Isaiah 29’s unique usage of imagery related to necromancy and several possible ways to understand it, see Brown, “Out of the Dust,” 32–34. 6. For a discussion of the term Ariel, its possible etymology, and its association with Jerusalem, see Cloward, “Isaiah 29 and the Book of Mormon,” 192. 7. See Isaiah 8:19; 19:3. See also, Brown, “Out of the Dust,” 32–33. 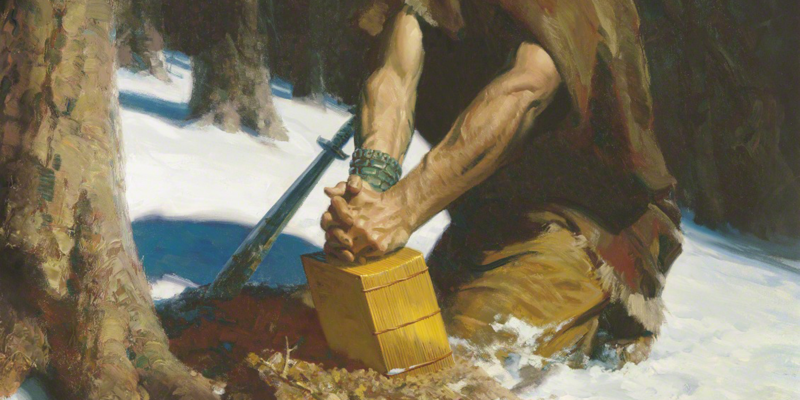 For a different interpretation, see Paul Y. Hoskisson, “The ‘Familiar Spirit’ in 2 Nephi 26:16,” Insights 28, no. 6 (2008): 7. 8. “In other words, [Jerusalem’s] voice will be like that of a ghost from the underworld, chirping from the dust as one seemed to expect when the necromancers contemporary with Isaiah called up the dead for consultation with the living (Isaiah 8:19). If Jerusalem was not dead yet, the best that one could say for her was that she already had one foot in the grave.” J. J. M. Roberts, First Isaiah (Minneapolis, MN: Fortress, 2015), 364. 9. For instance, Nephi earlier declared that he would “write more of the words of Isaiah, for my soul delighteth in his words. For I will liken his words unto my people” (2 Nephi 11:2; emphasis added). See also, Grant Hardy, “2 Nephi 26 and 27 as Midrash,” Insights 24, no. 173 (2004): 2–3. 10. The plural sense of this text is reflected in the Septuagint translation of Isaiah 29:4, “thy voice shall be as they [phōnountes] that speak out of the earth” (emphasis added). For the importance of dust-related imagery, see Brown, “Out of the Dust,” 29; Cloward, “Isaiah 29 and the Book of Mormon,” 193–194; Jeff Lindsay, “‘Arise from the Dust’: Insights from Dust-Related Themes in the Book of Mormon (Part 1: Tracks from the Book of Moses),” Interpreter 22 (2016): 179–232; Jeff Lindsay, “‘Arise from the Dust’: Insights from Dust-Related Themes in the Book of Mormon (Part 2: Enthronement, Resurrection, and Other Ancient Motifs from the ‘Voice from the Dust’),” Interpreter 22 (2016): 233–237; Jeff Lindsay, “‘Arise from the Dust’: Insights from Dust-Related Themes in the Book of Mormon (Part 3: Dusting Off a Famous Chiasmus, Alma 36),” Interpreter 22 (2016): 295–318. 11. See Brown, “Out of the Dust,” 36–37. 12. See Book of Mormon Central, “What Do Nephi and Isaiah Say about the End Times? (2 Nephi 23:6),” KnoWhy 46 (March 3, 2016). 13. See Cloward, “Isaiah 29 and the Book of Mormon,” 200. 14. For a modern condemnation of necromancy, see Robert J. Matthews, “What the Scriptures Say about Astrology, Divination, Spirit Mediums, Magic, Wizardry, and Necromancy,” Ensign, March 1974, online at lds.org. 15. Clearly there is a significant difference between God bringing angels to speak to Joseph Smith and a medium bringing spirits back from the dead to speak with people. For more on the distinction between magic and religion, see Eric A. Eliason, “Seer Stones, Salamanders, and Early Mormon ‘Folk Magic’ in the Light of Folklore Studies and Bible Scholarship,” BYU Studies Quarterly 55, no. 1 (2016): 73–93, esp. 86–92. It should also be recognized that the Book of Mormon repeatedly condemns various forms of witchcraft. See Alma 1:32; Mormon 1:19; 2:10. 16. See Book of Mormon Central, “Why Did the Book of Mormon Come Forth as a Miracle? (2 Nephi 27:23),” KnoWhy 273 (February 10, 2017). 17. The Bible actually contains several examples of deceased or translated persons interacting with the living. For example, Christ and his chief apostles communicated with Moses, Elijah, and John the Baptist while on the Mount of Transfiguration (Matt. 17:1–13; Mark 9:2–13; Luke 9:28–36). See Larry E. Dahl, “Who appeared to Peter, James, and John on the Mount of Transfiguration? What was the purpose of their appearance?” Ensign, April 1983, online at lds.org. It should also be noted that Jesus Christ Himself appeared to His disciples after His resurrection and committed them to share His message to the world. While Christ’s resurrected body makes the circumstances somewhat different, his post-death visitation to a select group of mortals to communicate a message to the living is conceptually similar to necromancy. 18. For instance, Jesus compared God to an unjust judge (Luke 18:1–8), a woman to a dog at a table (Matthew 15:26–27), the apostle Peter to Satan (Matthew 16:23), and the reception of Christ’s Atonement to an act of cannibalism (John 6:51–56). Yet, just because Jesus compared the sacrament to eating His flesh and blood doesn’t at all mean that Jesus was condoning the literal eating of human flesh or the drinking of human blood. While each of these metaphors teaches a powerful and holy spiritual truth, they can be confusing or unsettling if they are interpreted incorrectly. 19. See, for example, John A. Tvedtnes, “Elijah: Champion of Israel’s God,” Ensign, July 1990, online at lds.org. For other examples of prophets drawing upon pagan myths and beliefs to help teach spiritual truths, see Book of Mormon Central, “Why Does Jacob Choose a ‘Monster’ as a Symbol for Death and Hell? (2 Nephi 9:10),” KnoWhy 34 (February 16, 2016); Book of Mormon Central, “Why Are Later Jewish Sources Relevant to Texts in the Book of Mormon? (3 Nephi 4:28),” KnoWhy 478 (October 23, 2018). 20. As explained by Brown, “the imagery necromancy conjures in these passages is both rooted in the actual practice and transmits these concepts through metaphor to juxtapose YHWH [Jehovah] against popular religion and its practices.” Brown, “Out of the Dust,” 37. 21. The prophet Nephi declared, “we talk of Christ, we rejoice in Christ, we preach of Christ, we prophesy of Christ, and we write according to our prophecies, that our children may know to what source they may look for a remission of their sins” (2 Nephi 25:26). 22. Elder Richard G. Scott has explained that the scriptures can become “stalwart friends that are not limited by geography or calendar.” Richard G. Scott, “The Power of Scripture,” Ensign, November 2011, 6, online at lds.org. See also, Book of Mormon Central, “Why Is It Important to Keep Records? (1 Nephi 9:5),” KnoWhy 345 (July 28, 2017). 23. See 2 Nephi 33:10–15; Mormon 8; Mormon 9; Moroni 10.